MegaDrum is a very powerful yet affordable MIDI drum trigger. It can be used with many varieties of Edrum kits/pads/cymbals and outputs MIDI signals which can be fed to a computer with drum sampling software,e.g. BFD, Toontrack, Addictive Drums, to produce wide variety of drum sounds or it can be connected to a drum machine. It can be compared with Roland TMC-6 but with more inputs and more capabilities. MegaDrum started as DIY project and over time evolved into a a versatile device which can be ordered as a complete module, kit or you can still build it yourself. MegaDrum is fully plug-n-play and is USB MIDI Class Compliant, i.e. will work with Windows, Mac OS X, Linux without additional drivers! See Forums for latest news/development/discussion. Don't have much DIY skills? 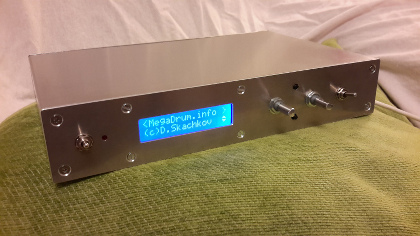 Want to own a MegaDrum module as soon as possible? Look at MegaDrum kit! Don't have time to build it yourself? I can build it for you. See 32 inputs and 56 inputs versions. You'll need to register on the forum to see pictures. A video demo of a custom drum kit in action with MegaDrum as edrum MIDI trigger. Thanks to Anders (aka ZourMan) for making the video! ARM (STM32F205RCT6 at 120MHz STM32F103RCT6 at 72MHz) based MegaDrum modules and kits with very lower latency. You can also be assured of long support as I still release firmware versions for old Atmega644 and Atmega1284 based MegaDrum modules back from before 2011. MegaDrum firmware is regularly updated and you can always upgrade to the latest firmware from a PC using MegaDrum Manager FX. USB powered. No need for a separate power supply. Different MIDI I/O options: standard MIDI or/and MIDI over USB MIDI. Potentiometers free design. You don't need pots at all and this saves quite some money. 9 levels input gain set individually for each channel. Supports Dual Zone Piezo-Switch pads. Supports 3 zone Roland style cymbals (e.g. CY-12/CY-15). Sopports 3 zone Yamaha style cymbals (e.g. PCY150S). SysEx support. MegaDrum can be configured from a PC using MegaDrum Manager FX. 8 Crosstalk suppression groups with individual crosstalk suppression levels in each group. Can save 2 or 4 configs and 7 or 13 Drum Maps (depending on the MCU type). Can save more than ~30 configs and Drum Maps with optional EEPROM. Individual midi channel, dual/single pad, auto/manual sensitivity and curve settings for every channel. Velocity curves for each individual channel can be compressed and shifted. CC Choke support on every Dual Zone piezo/switch pad or 3 zone cymbals. Most types of switch or variable HiHat controllers with CC position support and dedicated notes on all zones for 5 levels of intermediate levels of the pedal positions. 23/31/47/55 velocity sensitive trigger plus HiHat Controller inputs giving in total 24/32/48/56 channels. HiHat controller is auto/manually level adjustable. Each inputs (HiHat controller and Kick are excluded) can either be configured as Single inputs or joined into Dual Zone inputs (both piezo/piezo and piezo/switch pads are supported) or 3way/3 zones inputs. 10 Different types of velocity curves plus 4 custom curves. Each channel can be assigned an individual curve. Different LCD options: color LCDs with 320x240 or 160x128 resolution or alphanumerecal 16x2 LCD with VU meters. 4 button user control buttons with quick jumps: when in the menu you can jump to another pad channel settings by hitting this pad while holding HiHat controller pressed down.